If you're in between sizes and have any tummy flaws, we recommend ordering up as the jeans are the most tight in this area. The fabric has a light stretch but the waist band hardly stretches. 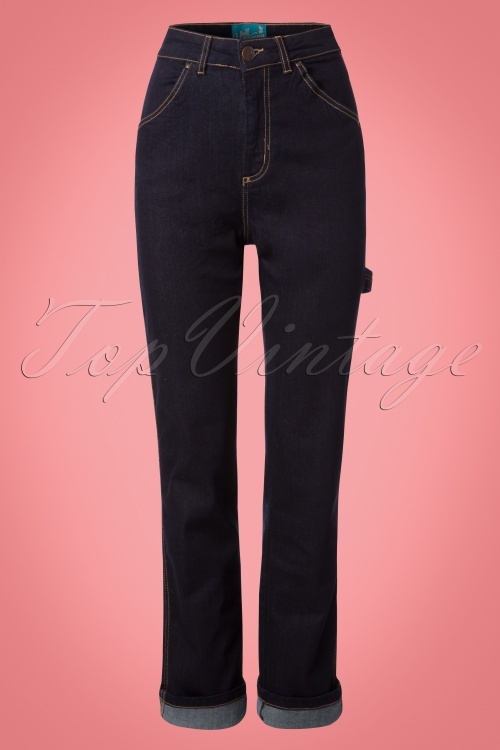 These 50s Carpenter Jeans in Denim are a real classic! The first denim trousers were made in 1847 but in the 1930s they became really known when Hollywood started producing Western movies. 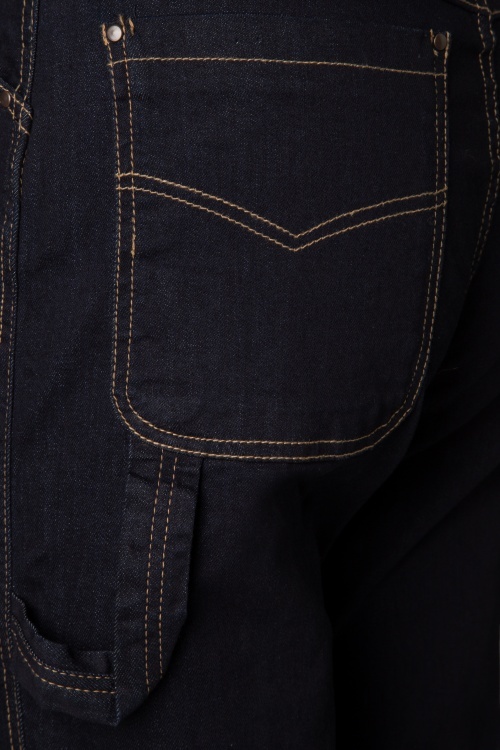 Denim then changed from work wear to television icon, but it were movie stars like John Wayne, James Dean and Marilyn Monroe who are responsible for the real denim success! 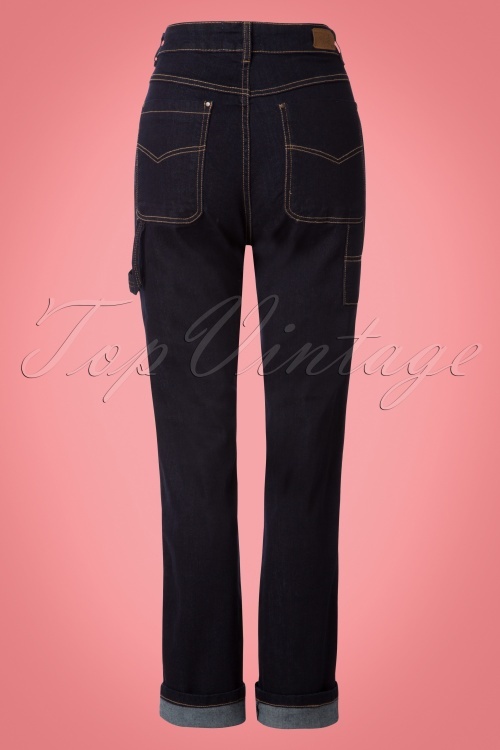 These Carpenter Jeans are just perfect for those tough girls among us thanks to the high waist, slightly wider legs, so called hammer loop and additional small tool pocket to the side. The legs can be turned up to give her an extra portion of sassyness ;-) Made from a firm yet supple dark blue cotton blend with a light stretch that's super comfy to wear and is finished off with contrasting stitching. 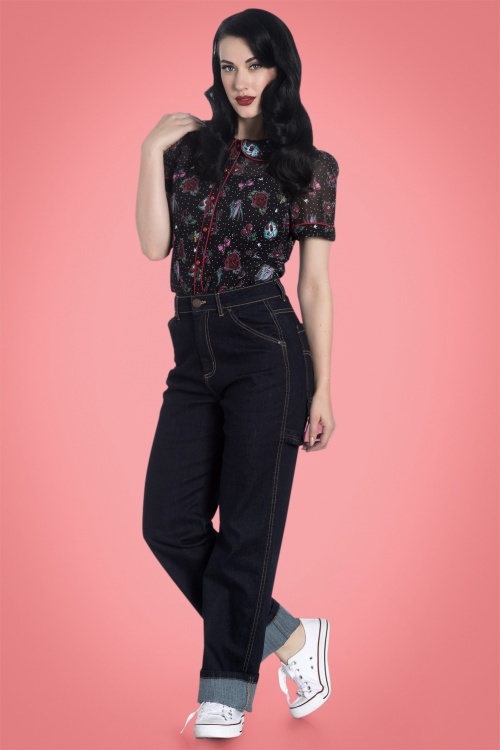 These Carpenter Jeans totally nailed it! 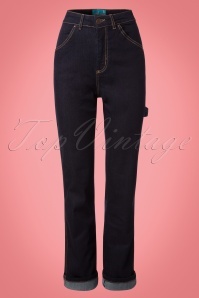 zo leuk deze vintage model jeans, mooie donker wassing en recht model. heb maat S besteld maar had denk ook een xs gepast, de bovenkant zit ruim (kan er makkelijk twee handen tussen steken) en draag hem daardoor baggie. Ce pantalon des années 50 est parfait. Il faut juste que je le tourne en bas. Comme d habitude le guide des tailles correspond je suis ravie!!!!! La veste en effet est pour la mi-saison et est extensible. Le Jean est parfait et agréable à porter ainsi que le pull. Great jeans, I had to have them lengthened a tad but that's cause I'm a giant. No other comments just happy!